Greetings on this Good Friday morning. As we celebrate the death, burial and resurrection of our Lord and Savior Jesus Christ, let us give thanks for the grace that has been bestowed upon us. Even as we were sinners, His love was shown to us and the ultimate sacrifice made. So as you mourn the death of Christ on the cross, I leave you with the following prayers to bless your day. Heavenly Father, How Great Thou art and how gracious Your great redemption plan for mankind. We thank You greatly as we walk through this day and commemorate the great love and sacrifice of Your beloved Son Jesus. We thank You, gracious God, for Your great redemption plan, through which we are called Your offspring and by which we understand there’s a forgiveness incomprehensible, a love inexhaustible and a life unimaginable, in our Lord Jesus Christ. Lord Jesus, how can we thank You for the great love You have for us. How can we ever repay You for the price You paid on the cross. How can we, Lord, ever forget the great sacrifice of You, laying down Your life that we may live and have life to the fullest. And how great is Your saving Grace that made us one with the Father, in reconciliation and in life eternal. Through the crowns of thorns and scourging, and through the cross, You carried our sins. 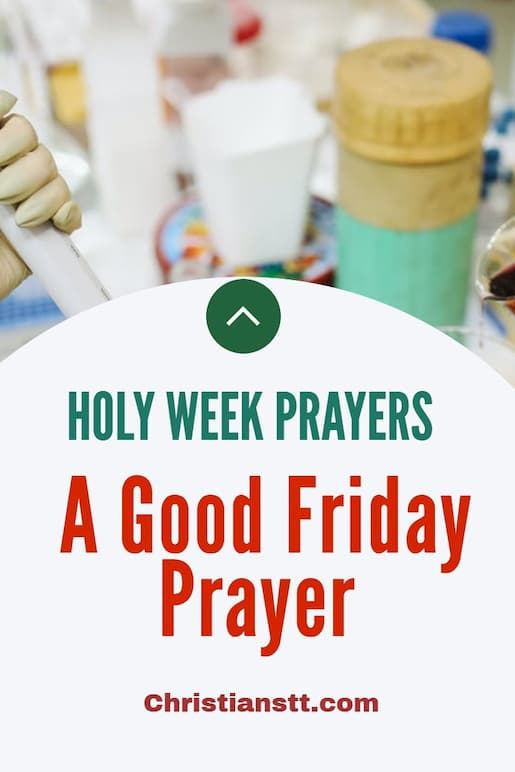 We pray to remember to carry our cross and heed Your call to follow You. And, through sorrow, pain and torment of the world, only remember Your journey of laying down Your life for us. May we rejoice to know that through our suffering, we have Your compassion and love. And, in Your perfect timing, You will set us free from all danger, evil and illness. We pray and meditate on the seven last words of Yours before You gave Your life for the world. Lord Jesus, we come to You in repentance and reconciliation and forgiveness. Through the power of the cross You have redeemed us. So, we seek Your pardon for the times we have failed You in sin, living a life of self contentment and very much of the world. Help us, in our journey of faith, to follow Your simple, humble, loving and caring way of life and receive Your grace in this world and in the world to come. Lord, we pray that by our faith and by our ways, and in our great love for You, that we may find favor and forever in You abide. Through Your Holy Spirit, lead us we ask, that we may do all things pleasing in Your sight. Help us Lord, to always stay in Your presence and light. Lord, we see Your great care, love and compassion revealed in Your words to Your mother at the cross. May we, in our lives, be filled in this same care, compassion and love, as we are called to love and serve our fellow people. Help us to not see separation. Help us Lord to not define others by color and status. Instead may we love all, in selflessness and goodness and avoid all evil. O gracious Lord and Savior, at times we cry out for help and at times we feel forsaken. Help us to remember the way You were forsaken by mankind. May we not dwell on our sufferings but leave them at Your feet, trusting that You know what’s best for us. May daily fervent prayer be our armour in conquering our times of fear and trouble. We pray, Lord, to thirst for goodness and righteousness, and we thirst for Your living waters that may never run dry in us. May we thirst to be filled, through Your Holy Spirit, with wisdom, discernment and prudence, in a world of folly. We pray that we always quench our thirst in Your blessed name and Your great love. O Lord, Jesus Christ, who finished the work that you were sent to do, enable us, through your Holy Spirit, to be faithful to our call. Grant us strength to bear our crosses and endure our sufferings, even unto death. Enable us to live and love so faithfully that we also become good news to the world, as Your witnesses. Father, into whose hands your beloved Son Jesus Christ commended His spirit. Grant that we, too, may follow His example in all of our lives. And, at the moment of our death, entrust our lives into Your faithful hands of love, that we may be brought in Grace into eternal life. We thank You for this great mystery of the cross. We pray, in the blessed name of Jesus, who gave His life and love. Amen! Thank you for saving our lives jesus christ. No is merciful and wonderful as you. I praise and adore you. Amen. What Beautiful Name of Jesus our Lord Jesus Christ. Thank You for saving me Jesus. You found me I was so low You kept looking until You found me. I was a sinner undone You filled me with Your Love and gave me life everlasting. Jean!!!! I LOVE JESUS !!!!! Thank you Jesus for the love, and sacrifices you had to sustain for us to have everlasting life and freedom. Knowing that you’re still with you us and you will never leave us nor forsake us. Thank you for your grace and mercy!! I love you Jesus Christ! Jesus, you are indeed an awesome God. Your Love is unfailing, and your sacrifice unyielding. We thank you for all you have done for us at the cross, and are doing in your sanctuary. How manifold are your many blessings. You have such great love and power, you are still giving, you never sleep nor slumber, you are always with us, watching over your flock. We love you so much for who you are, and all you do for us. Lord Jesus, I give you my life and I choose to serve you, all the days of my life. Thank You for your Faithfulness towards us. All the Praise and Glory belongs to you Jesus. We Love You! THANK YOU OH LORD JESUS !! !….BLESSED IS YOUR HOLY NAME!!….. Almighty Jehovah, I praise and adore you. You are awesome and I love you. Thank you for giving your life on the cross for me. Teach me daily to be grateful to you for your unconditional live and sacrifice. God, I truly don’t deserve your love but your grace and mercy has brought me this far. There are days Lord when I feel like I can’t make it but you gave me strength to endure as a brave soldier. Thank you Mighty God. I praise You my dear Lord Jesus Christ.I love You with all my heart. Today,I just want to thank God,for the gift of this life. I thank you Lord,for the cross of my Lord Jesus Christ.Amen. I am so thankful for fresh grace and new mercies. You are such as awesome God. Glory be to Our Lord Jesus Christ.We all love You forever. I praise You my dear Lord God Jesus Christ,for You are my Lord,my life,my Savior. We thank you for all You have done for us. By Your blood and Your cross,so that we all have eternal life. Glory Be To Our Lord Jesus Christ,for You are our life. You are our Amazing Grace. We love You forever and ever. My Lord and Savior, it’s my joy to honor You. Yes, You are our amazing Grace. Many need to realize this gift in unselfish acceptance.